1. Do not touch the face of the coverslip or the hemacytometer face with your fingers. Grease from you fingers can prevent the chamber from filling properly. 2. Rinse the hemacytometer and coverslip with distilled water, dry using kimwipes and clean with lens paper. 3. Mix sample with Pasteur pipette. With the coverslip in place, use a Pasteur pipette to transfer a small amount of the cell suspension to the counting chamber. Carefully touch the edge of the coverslip with the pipette tip and allow the chamber to fill by capillary action. Repeat with other chamber, mixing sample well before loading. 5. 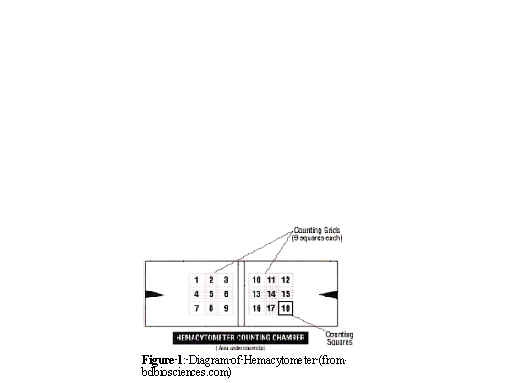 Each square of the hemacytometer (with cover slip in place) represents a volume of 0.1 mm3 or 10-4 cm3. Since 1 cm3 is equivalent to 1 mL, the subsequent cell concentration per mL (and the total number of cells) will be determined using the following calculations. Total cell number = cells per mL x the original volume of fluid from which cell sample was removed. Example: 4.5 x 105 cells mL-1 x 10 mL (culture volume) =4.5 x 106 cells total in the culture volume. 6. Clean the hemacytometer with distilled water, dry, and place in storage box.